Although indications for the procedure are debated, cholangiography remains a vital tool for the surgeon performing cholecystectomies. One potentially viable argument against routine cholangiography relates to the associated increase in time and money associated with this procedure. The purpose of this study was to evaluate the time associated with routine cholangiography in a residency teaching program. A retrospective review of all patients undergoing laparoscopic cholecystectomy with intraoperative cholangiography from a single surgeon was reviewed from 4/2010 to 9/2011. Cases performed without a resident and cases where laparoscopic common bile duct explorations were performed were excluded. Cholangiogram times, deemed as time from initial placement of a clip on the cystic duct until removal of the clip after the cholangiogram was performed, were collected prospectively by the attending surgeon. Demographic information and operative information were documented and factors associated with increased cholangiogram times were compared with a p-value of <0.05 considered significant. Laparoscopic cholecystecomy with intraoperative cholangiography was performed in 54 cases. Average age of the sample was 43 years with 69% Caucasian and 74% female. Cholangiography was successful in 96% of patients. Residents from each level of training were evaluated with the most common being 3rd year residents at 48%. Average total time for cholangiograms performed by residents was 11 minutes (range 6-22 minutes) with an average operating room time of 68 minutes (range 32-103 minutes). The average percentage of the case taken up by cholangiography was 17% (range 9-63%). Minor technical complications relating to cholangiograms occurred in 37% with the most common being difficulty with clipping the catheter occurring in 20%. There was no significant difference in completion rate or cholangiogram time based on resident level of experience (p>0.05). 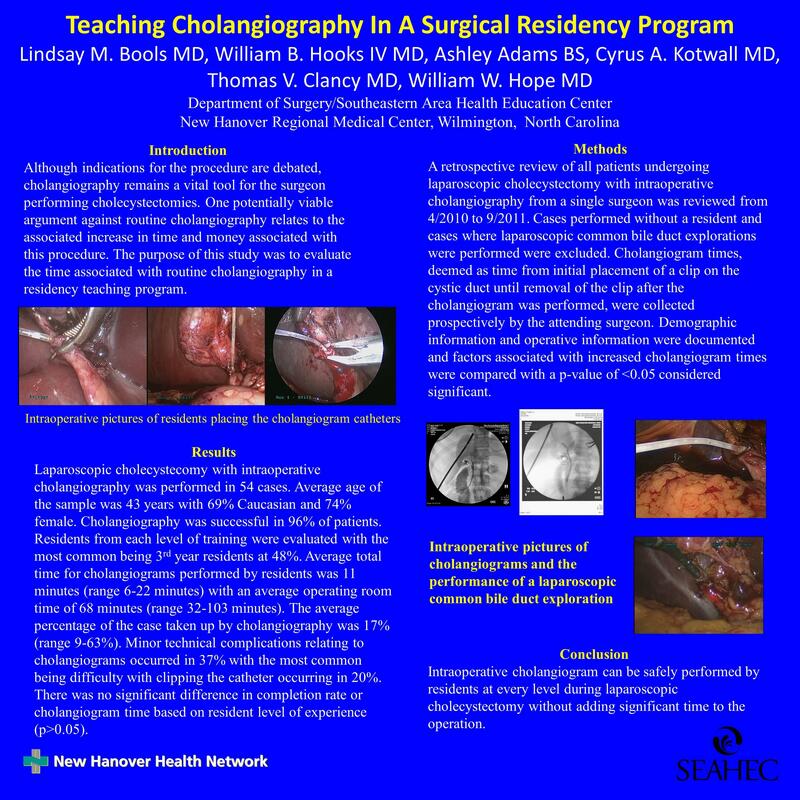 Intraoperative cholangiogram can be safely performed by residents at every level during laparoscopic cholecystectomy without adding significant time to the operation.